Are you looking for a fantastic way to clean up those sticky hands and messy feet? Summer is right around the corner which is a time to get outside, get dirty, and have fun! 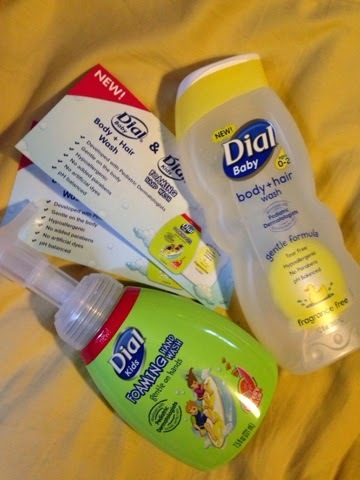 I am so happy Dial sent me these great products for review, because this is a time we are thinking about how to get clean! The Dial Baby Body and Hair Wash is PERFECT for summer! The scent is nice and light, and it is so easy to clean with one easy products. My kids have been LOVING the Dial Kids Foaming Hand Wash! It is a fun foam, and it gets them to WANT to wash their hands! Want to try it out for yourself? Enter below to win 2 coupons (each coupon is for a free body & hair wash OR a hand wash-- so with two you can get both!). MamaBreak received the products shown to review here on the website. We did not receive any other type of compensation. As always, our opinions are our own. Our family stays clean in the summer by taking moisturizing baths or showers. We like to visit area pools a lot so that means tons of chlorine which leads to dry skin for every member of my family. We try to make sure it doesn't become a problem by choosing moisturizing body washes. i find i take more showers....especially at camp after swimming or playing on the beach....need a good body wash! We stay clean by taking more baths and showers. Take more baths in the summer. If work in yard, when come in shower then. But then still have a reg bath before bedtime. I have to take a shower at least once or twice a day but I do keep my A/C on often. I like to take a shower in the morning and a shower at night. I definitely take more showers in the summer! I take showers and wash my hands frequently. I shower in the morning and at night from being outside all day! I always try to make sure I take a shower after the pool or beach! I shower everyday, especially if I sweat at all. Take a shower daily to feel refreshed. I take one or two showers a day in the summer. Daily showers and towelette when out and about. I like cool showers before bed. Taking showers :) Swimming is very refreshing too. A good sugar scrub leaves me feeling clean in the summer. I like to stay clean in the summer with short cool showers. I take frequent dips in our pool! I like to stay clean during the summer with soothing showers and talcum powder. A couple showers a day and lots of deodorant. It gets so hot here in Louisiana. Here in Alabama, at least two showers a day are required to stay clean. Lots of showers and Im obsessed with hand sanitizer!! Lots of hand sanitizer and hand washing. since I work in a prison, I wash my clothes as soon as I get home! By taking more showers and washing my hands more often. Regular showers, hand washing, drinking lots of water, and changing clothes when needed. I take a shower everyday and sometimes two.